The purple-handled Fiskars student scissors stay in my desk drawer at the computer end of the studio. I get very bent of shape if they get moved. The orange-handled scissors are my workshop scissors. I have lots of them. When I first started teaching I thought I would mostly work with parents and teachers. It turned out over the years I have most often taught children. They managed quite well and the younger ones found using grown-up scissors rather thrilling. I store them in plastic shoe bins and carry them to workshops in a large plastic container which also holds bins of glue sticks and hole punches. The small red scissors are in my work kit (a shoe box) for the Spirit Books which holds scissors and needles and whatever beads or thread I need for a particular project. The silver scissors were purchased at a discount store in Northampton, MA and are wonderful. They are in a drawer at the workshop end of the studio. 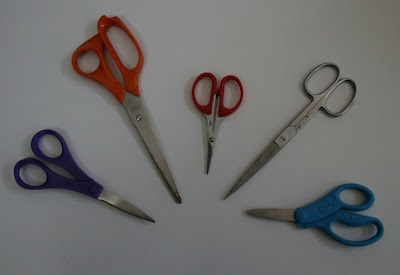 The small blue-handled scissors are also for workshops. I really don't like blunt scissors but I use these for DIY workshops where parents and kids move through stations with materials and bookmaking instructions. Occasionally parents are more interested in talking to their friends than watching their children and I go for safety especially when there are young children. Here's a little scissors history and superstitions at uncommon scissors.